I'm exceedingly interested in participating in this challenge once again for 2018! Read a ton of books by one favorite author for the year? Definitely something I tend to do! I really only have four books of Jayne Ann Krentz's Harmony series (written as Jayne Castle) left to catch up with. But I also have at least two other series by her that I'm interested in giving attention to, with three and four books in each series, respectively. Then there are a few random standalone Romantic Suspense novels that I currently own that require some reading. 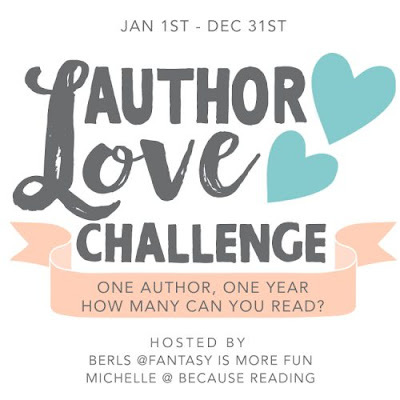 Due to a typo, I had originally chosen Jayne Ann Krentz because I thought I had to read a minimum of 15 books for this challenge, and she seemed the most likely author candidate. But with clarification, the challenge's minimum number of books for the chosen author is now 5. And so I decided to just keep my originally intended author choice, but tweaked the number a little bit, just for my own satisfaction. All-in-all, I think I can squeeze one book in per month and read at least twelve books. If I can read more, then that would be very awesome as well. I've caught up with a lot of series in 2017, so only have a few pressing books on my TBR to get to... or something like that. I had considered going back to Jill Shalvis, as there are many, many of her contemporaries that I've yet to get to, and then some. There was also Nora Roberts, Courtney Milan, and Tessa Dare. In the meantime, I'm also curious enough about Terry Pratchett and Elizabeth Peters to want to give their books/series a spin. Jayne Ann Krentz, however, still won out. So obviously this is a lot more than twelve books, but I'm not changing my goal... if only because I'd rather not stress myself out by trying to read twenty-eight books by Jayne Ann Krentz in one year. It's probably possible, but my reading moods are ever so wishy-washy. And as much as I've loved Jayne Ann Krentz, it is entirely possible for me to get completely tired of reading her books pretty quickly if I read too many in a row. On an additional note, I have purposefully not chosen to include any of her books written as Amanda Quick... for whatever reason I'm not sure. But there it is.